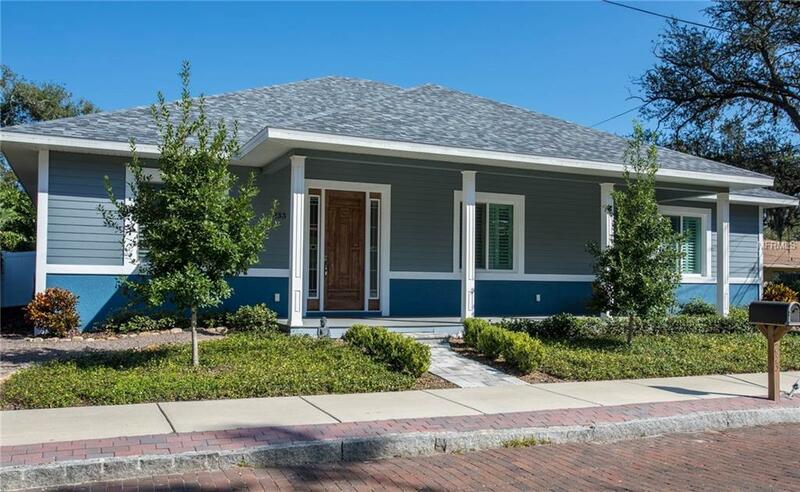 Enjoy evenings on the front porch of this custom-built home with contemporary accents blended into the historic district of downtown Safety Harbor. The front door opens to a foyer featuring wainscoting, crown molding and Italian porcelain tile throughout. The soaring 16ft ceilings showcase an open design concept illuminated by natural light. The gourmet kitchen is wrapped in cabinetry with full extension, soft-close drawers and a 10ft center island with Italian granite & farmhouse sink. A Thor 6-burner gas range is highlighted by the marble backsplash and designer light fixture with an adjoining spacious Dining Room. In the Great Room, a built-in cabinet with Klipsch sound system and 75in 4K TV will impress any entertainment enthusiasts. The Master boasts an 18ft walk in closet, a dedicated AC and plantation shutters. The En Suite bath includes a glass enclosed rain shower with infinity drain, water closet and double vanity. The additional bedrooms, laundry and baths are detailed by the same quality craftsmanship. The landscaped patio is the perfect surrounding to relax in the heated salt water spa or grill out. This environmentally conscious smart home has hurricane impact windows, R-38 insulation, programmable thermostat & LCD lighting. Exterior features are Hardie board siding, oversized garage with extra parking & security cameras. Nestled within walking distance of award-winning restaurants, 3rd Friday concert series, weekend festivities, farmers market & the famous waterfront Spa & Marina. Additional Lease Restrictions Check With City Of Safety Harbor For Leasing Restrictions. Pet Restrictions Check With City Of Safety Harbor For Pet Restrictions.